Yes, Yes, Yes, Pipelines Galore ... ! Tom Morgan and his wife are retired and split their time between Greenville, North Carolina, and their place near New Castle, Virginia. Their home and property in the Sinking Creek area of Craig County is directly in the route of the Mountain Valley Pipeline, according to proposed alternate route 110J. Whether you think you are for or against the use of natural gas or the expansion of that use or the building of the pipelines that will bring that gas to or through Virginia, you have to be concerned about the “master plan” — the goal for natural gas in Virginia and how we get there. You have to be concerned because no master plan exists. And, no one is actually assessing the public need for any specific pipeline or coordinating plans for pipeline infrastructure development. Currently, pipeline companies propose interstate pipelines and routes to suit their purposes. The Federal Energy Regulatory Commission reviews and approves each proposal according to its requirements. And . . . that’s it. Although environmental assessments and other agency and public input are a part of FERC’s review process, only FERC has final authority for review and approval. FERC reviews each pipeline application as an independent project. If the project meets FERC guidelines, it is approved. In the absence of state or federal strategic plans for the development of pipeline infrastructure, essentially no effective coordination among other proposals, assessment of their cumulative effects, assessment of need, or optimization of routes is performed. No agency or person can override FERC’s decisions, other than the courts — and even then, FERC decisions ultimately prevail in almost all cases. 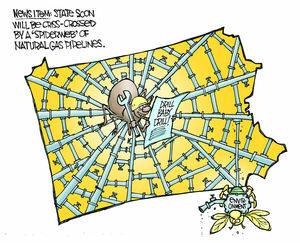 States and localities have little or no authority regarding interstate gas pipelines. The pipeline companies are spending billions on these projects with the anticipation of significant returns on their investments. FERC is under considerable pressure to approve these projects as rapidly as the required assessments are performed and the “boxes” checked off. In fact, FERC reports no pipeline submission in recent years has been denied — although some have been withdrawn or never built after approval. Landowners, communities, and other concerned interests use their limited resources to expose and explain the local consequences of building these large pipelines in their areas. Natural resource and environmental agencies and organizations provide scientific information and data regarding anticipated or possible effects of pipelines, but have no overriding authority for pipeline approval/disapproval. Recent editorials and articles suggest potential hope for a better way forward. Many reasonable and knowledgeable people are recommending consolidation of pipelines along established rights of way or easements in order to minimize the negative consequences of these pipelines. The Pennsylvania EPA is creating a team from the involved stakeholders to collaborate on coordinated plans for future pipeline development. The Nature Conservancy has developed software that will help optimize routes for pipelines. How can anyone be opposed to such approaches? Yet, none of these ideas are being effectively pursued in Virginia. The pipeline companies see no need since they can get what they want using FERC’s process. FERC does not because it is not their charge. Private individuals and localities do not because they lack the authority, power and resources. Our elected officials are inexplicably silent. Why does this matter? It matters because uncontrolled development of natural gas pipelines can change the character of our state forever. It matters because eminent domain can be used to take your property, and no process exists to assess whether that use was even necessary. If FERC approves a pipeline, the company can take your land to build it, and no one is collaboratively assessing the need or optimizing the routes. We must look at where this is headed. In Pennsylvania, a “spider web” of pipelines in every county is foreseen — with 4,000 miles of interstate pipelines and 25,000 miles of “gathering pipelines” from the wellheads — in a process that has been described as chaotic. Without some type of action and intervention, Virginia’s fate will mirror that of Pennsylvania. What can you do? Let your voice be heard. Learn about the process and the consequences. Insist that your elected officials understand the issues and risks involved, and are bringing rational and reasonable thought, consideration, and decisions to the growth of natural gas pipelines. Learn from the experiences of other states. Hold your public officials accountable for their actions and decisions — or lack thereof. We can have natural gas and protect our land and natural resources if we assure that our common long-term good is the primary motivation and consideration. However, if we do nothing and allow the pipeline companies to proceed in their own best interest — as they are doing now — we will not be happy with the outcomes nor will those who come after us. A similar letter entitled “Gas Pipelines Will Change the State” appears as a Letter to the Editor of the Richmond Times Dispatch, page A-10, September 11, 2015. See also: Appalachian Mountain Advocates and Friends of Nelson, the County in Virginia. McAuliffe, a supporter of the Mountain Valley Pipeline and separate Atlantic Coast Pipeline project to the north, made an early-morning appearance at the Hotel Roanoke where he spoke to about 75 people at a business council of Roanoke breakfast that was closed to the media. EQT Corp., NextEra Energy and other partners, including WGL Midstream, are behind Mountain Valley Pipeline LLC. The pipeline venture is preparing to file for approval with the Federal Energy Regulatory Commission later this year. The partners’ intent is to run a pipeline from Wetzel County, West Virginia, to Pittsylvania County to transport natural gas extracted from hydraulic fracturing. In 2014, WGL Midstream announced a sales agreement to export natural gas to India. Last month, a spokesman with WGL Midstream wrote in an email that the Mountain Valley Pipeline could be part of the company’s supply portfolio for exports to India, depending upon market conditions and other factors. The Senate is now split 21-19 in favor of Republicans. If Democrats pick up one seat, they’ll effectively control the chamber with Lt. Gov. Ralph Northam breaking ties. Edwards, a five-term incumbent, is facing a well-funded Republican opponent in Nancy Dye, a retired surgeon. He also has an independent challenge from Roanoke Commonwealth’s Attorney Donald Caldwell, a longtime Democrat. Edwards differed from McAuliffe on the pipeline issue and said there is “no question” the natural gas will end up going overseas. One partner in the Mountain Valley proposal recently said the project could be used to supply exports to India, though no final decision has been made. “The idea that it’s not going to go overseas, I don’t think anybody believes that,” said Edwards, who’s raised concerns about the environmental and safety risks of the pipeline.